While it’s still quite wintry throughout much of the country, March and April in North Florida feel more like fall. In stark contrast to the old saying “April showers bring may flowers,” this time of year is actually the dry season for us here in Gainesville and Alachua County. If you want to have your home or business Landscaping looking great this spring and summer, it’s time to start preparing your Lawn and Tree care game plan. Read on for some tips on North Florida landscaping from the pros at Mr. Tree and Lawn Service, and learn more over at the University of Florida’s Florida Gardening Calendar. Check your sprinkler system to make sure it wasn’t damaged by winter freezes. Calibrate your sprinklers to ensure that your lawn is getting the water it needs, without wasting water by over-watering or overlapping zones. March usually marks the end of the dormant season. When you start to see new growth on trees and shrubs, it’s time to have them pruned. Add mulch to flower beds and around trees, but be sure you’re not making this common tree-killing mistake! Add some color to your outdoor spaces by planting annuals like begonias and zinnias in March. 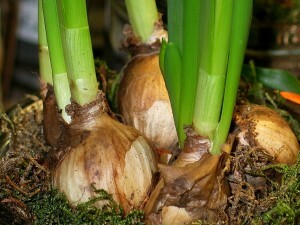 April is prime time for planting bulbs in North Florida, like irises, lilies, and dahlias. Plant your summer edibles in early March: Beans, tomatoes, corn, and squash. Wait until April to plant okra and cucumber. At our Gainesville tree service and lawn care company has a proven record of satisfying local homeowners and businesses, so contact us today for a free estimate!